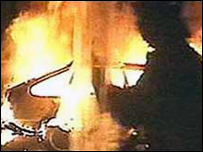 The 200th and final person to be jailed after the 2001 Bradford riots has been sentenced to 30 months in prison. Mohammed Sheikh, 33, from Ealing, west London, was jailed for riot, at Bradford Crown Court, after earlier admitting involvement in the violence. The riots resulted in 297 arrests, 187 people being charged with riot, 45 charges of violent disorder and 200 jail sentences totalling 604 years. The estimated damage was more than £7m and more than 300 officers were hurt. Some 1,000 police officers and support staff were involved on the night of the violence and nine police forces sent assistance. The court heard that Sheikh was among those throwing stones and bricks at the police lines. He was identified in 2004 as a result of a 10-month police poster campaign, which urged the public to name people wanted in connection with the riots. He gave himself up to police and pleaded guilty to his part in the riots at the court last month. Speaking after the sentencing, Det Ch Supt Max Mclean, Head of Crime at West Yorkshire Police, said: "In respect of the events of 7 July 2001, the police, like the Asian community, did not want right wing agitators coming into the city and had indeed banned a march and turned away known troublemakers from Bradford. "So it was a source of some sadness and frustration to us that events unfolded as they did. "It was a pointless act of self-destruction for Bradford citizens." He added: "It is unprecedented in English legal history in that the next highest figure in the UK for people convicted together for riot is five for an investigation in London."